Thirsty Pilgrim: Our Man in Amsterdam. Most of the you know the format, but I'm going to re-hash it for the rest of the class: Eighty of the very best places to drink real beer in Amsterdam. A featured beer for each spot. That's it. Simple and elegant and damned handy. Just the thing to pull out after excusing yourself from a companion who wants to spend hours browsing the tulip market. 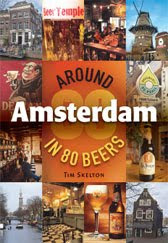 I know about seven really excellent places to drink beer in Amsterdam. Can't wait to learn about 73 more. More than half the fun is in flipping through, fantasizing and planning another Amsterdam trip that may or may not ever come. And congrats to Tim Skelton. I've got a very clear idea of the effort it takes to make a book like this. A hell of a lot of fun, and a hell of a lot of work.